It is the height of summer in Yem, and a fresh blanket of snow is being laid over the island. 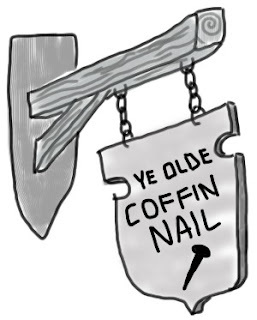 You approach The Coffin Nail, whose smoking chimney promises warmth and reasonably good food. At the corner of the building, several chained ghouls snarl as you approach. They bear The Dread Prince's brand, and are common enough a sight. As you swing the door open, you hear a heated debate. A strange beardless dwarf is arguing with one of the regulars. "I tell you, a lich is down there," the dwarf exclaims. "There's no lich in that castle, maybe a ghoul," an old man replies. "Let's ask the Ghoul Master," the dwarf says, "Avaric, could a ghoul survive down there?" "Well, strictly speaking, no," the uniformed elf replies. "The biggest problem with ghouls is how dependent they are on a supply of fresh corpses. We use them as shock troops, but they are not very reliable. 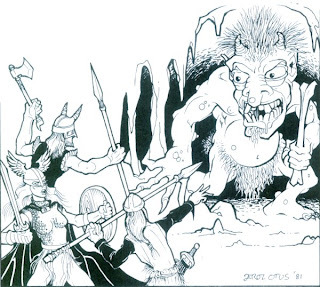 Start an assault, and they immediately run to the closest graveyard." "So, it's not a ghoul," the dwarf says. "Well, it ain't a lich, I can tell you that," replies the old man. "We should ask Archibald, he'd know." "Nope, no lich in that castle," the lich begins, "I daresay I know every lich in Yem, and there was never one in that castle. I remember the days when that was a thriving way-station for traders headed north. Those were better days..."
"Aw, what does he know?" the dwarf exclaims. "What kind of lich hangs out in a bar all day, anyway?" The black bolt of lightning strikes the dwarf before you realize what is happening. Everything goes black for a moment... When your vision returns, the bartender is sweeping up a pile of ash. You look desperately at the corner for an answer to your confusion, but see nothing but a table that has not been cleaned in months. "Bartender," you say, "what happened to the man at that table?" "Don't know what you're talking about friend," he replies, "finish your drink." He pours the ash from the dustpan into a large bottle, and sets it behind the bar. Are men saved before they become part of the body of Christ? Are men saved prior to putting on Christ? Are men saved before they are baptized into Christ? The answer is no, no, no. Men do not put on Christ before they are baptized in water. Faith in Jesus precedes being baptized into Christ.